and, as will be seen, it only took account of hull dimensions, without regard either to displacement or sail area. Lenore, 20-tonner. Designed and built by Mr. W. Fife in 1882, and owned by Mr. J. Grant. Erycina, Yawl, 96 tons. Mr. Percy F. G. Lord. A new 90-ton cutter, Erycina, was designed by Mr. Fife for Mr. A. Allan, and, though a very handsome vessel, she hardly came up to expectations. A new 40-tonner, Silver Star, of extreme dimensions was designed by Mr. A. Richardson for Mr. M. B. Murray, and she also was disappointing. A new 20-tonner, Lenore, was designed by Mr. Fife for Mr. J. Grant, jun., and though she showed great speed at times, she was not quite a match for Freda in her first season. On the whole, therefore, it looked as if the yachts of more moderate dimensions might suit the new rule. Lorna, Yawl, 90 tons. Mr. H. D. McMaster. fastest two-sticker afloat. 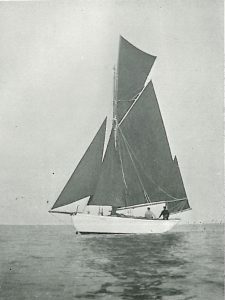 Lorna, a yawl of 85 tons, which was built by Nicholson the year before as a cruiser, figured largely in this season’s programmes, and was the fastest of her rig. Chittywee, 3-tonner. Designed by Ash in 1882 for Mr. H. Farmer. Keepsake, Length-Class 30-Footer. Designed in 1882 by Mr. C. P. Clayton. out late in the season, but did not figure very well. She was of extreme dimensions, and had a very large displacement. Honours were very fairly divided between Cocker and Nora in the 5-ton class, the former winning eleven firsts and the latter twelve. A new craft in the class was Circe, designed by Mr. Fife; she won five first prizes. 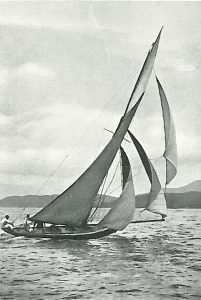 Another new craft was Trident, designed by Mr. W. E. Paton, which won two first prizes. 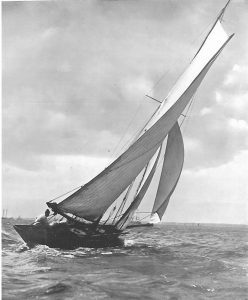 The 3-ton class consisted of Chittywee (Lord F. Cecil), Mascotte (Messrs. E. Quilter and Wynne­-Eyton), Muriel (Mr. H. C. Fox), Rival (Mr. J. H. Dudgeon), Senta (Mr. H. A. N. Atkins), and Snarleyyow (the Marquis of Ailsa). Mascotte won ten firsts, Chittywee eight, and Muriel five. 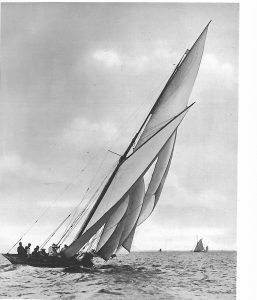 The 30-foot length class boats Keepsake (Major Forster) and Bonina (Mr. A. O. Bayly) made good racing on the Solent, the former designed by Mr. C. P. Clayton, and the latter by Mr. Dixon Kemp. Keepsake proved the more successful boat. These were boats of very large beam and sail. For the season of 1883 a new first-class cutter, Marjorie, was built for Mr. J. Coats, from Mr. G. L.
Marjorie, Cutter, 72 tons. Mr. James Coats, jun. Designed by Mr. G. L. Watson in 1883. 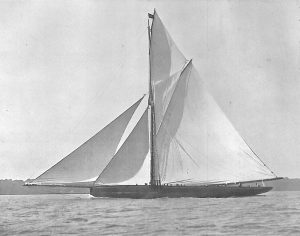 Watson’s design, and also the 125-ton yawl Wendur for Mr. J. Clark. The latter was not very successful, and seemed very hard to wake up. 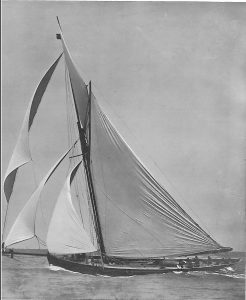 Marjorie did not sail so well in this her first season as she subsequently did, for Samœna beat her fifteen times out of twenty-three races in which they met. Samœna, however, was, like all Mr. J. Jameson’s yachts, always kept in perfect fettle, and her sailing-master, W. O’Neil, was, perhaps, the most painstaking skipper in this country. Lorna sailed in very good form, and scored six first prizes and six second. 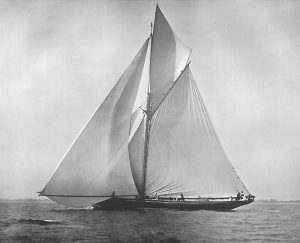 The only good schooner match of the season was between Miranda and Waterwitch at the Royal Yacht Squadron Regatta, but Miranda lost her bowsprit. Tara, 40-tonner. Designed by Mr. Beavor Webb in 1884. 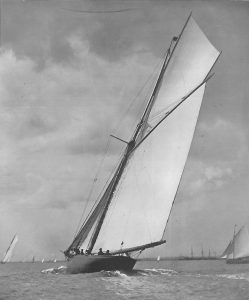 The 40-tonners were reinforced by Tara, designed by Mr. J. Beavor Webb for Mr. F. Taylor. She was a boat of very nearly six beams to length, and of great displacement. Silver Star (Mr. F. Connor) was greatly improved by an alteration of ballast, and May also had some lead added to her keel. Annasona sailed well, but missed the master-hand of O’Neil at the tiller. The racing in the class was excellent, and the vessels may be classed in point of merit as follows: May, Annasona, Tara, Silver Star, and Sleuthhound. Of the 20-tonners Lenore was undoubtedly the best boat. The racing was poor in this class, only Freda and Lenore racing in the north, and Amethea and Freda in the south. Lenore beat Freda ten times in thirteen matches. She was a very handsome vessel. 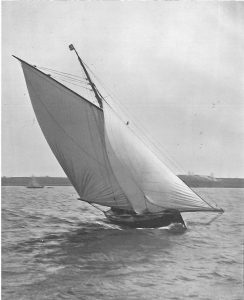 The 10-ton class had a new recruit in Ulidia, designed for Mr. W. Corry by Mr. W. Fife, jun., and she proved to be easily the crack boat of the class. Neither Verve nor Buttercup could beat her often. She was 42 feet long on the water-line, with 7 feet 2 inches beam, thus showing that the rule did not discourage narrow beam, as some hoped it would. The 5-tonners had a new yacht also, and one of great interest – viz., Mr. J. A. M. Heyn’s Olga, designed by Mr. W. E. Paton, who had previously designed Trident. She was altogether the best of the class, and was an excellent seaboat as well as fast. Her dimensions also were extreme, though her draught was by no means excessive. Nora, Cocker, and Cyprus had no chance with her, so that great things were expected of her young designer. Mascotte and Chittywee were the best of the 3-tonners, and they were very evenly matched. Bonina and Keepsake continued cracks of the Southampton length class 30-footers, the latter being the more successful. 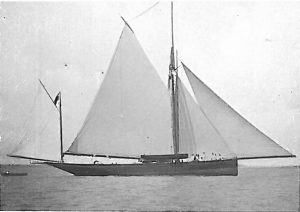 A length class of 21-foot boats was established this year, for which Mr. F. W. L. Popham built Bird o’ Freedom from Mr. J. Feltham’s design. She was easily the fastest of her class. Marguerite, 60 tons. Designed for Mr. Foster Connor by Mr. A. Richardson in 1884. 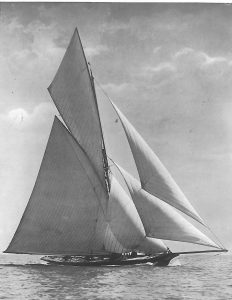 The season of 1884 was marked by the appearance of two new first-class cutters – Genesta, designed by Mr. Beavor Webb for Sir Richard Sutton, and Irex, designed by Mr. A. Richardson for Mr. John Jameson. In addition to these, Mr. Foster Connor had a new 60-tonner, Marguerite, designed for him by Mr. A. Richard­son. Marjorie, however, seemed to have improved her form, winning ten firsts, Irex securing eight, Genesta seven, and Marguerite only two. A grand fleet of large vessels mustered on the Clyde, including Wendur, Lenore (schooner), Erycina, Irex, Vanduara, Genesta, Marjorie, Marguerite, and Neptune. Lorna and Miranda reinforced the fleet on the south coast. Lorna was as good as any of them, winning ten first prizes – a capital record. Miranda was hardly good enough for such company, but Wendur won five first prizes. From this it will be seen that the season was busy, and, indeed, there has seldom been such racing since. Of the 40-tonners, Tara had Annasona for her chief antagonist, but she won no less than sixteen first prizes, whilst Annasona only secured three. 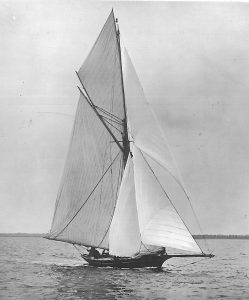 A new 20-tonner, Clara, was designed by Mr. W. Fife, jun., for Mr. J. G. Clark, but she met no formidable competitor, being much the fastest boat of her class yet built. Ulerin, 10-tonner. Designed by G. L. Watson in 1884 for Mr. E. H. Hamilton. The 10-ton class had two new yachts viz., Marguerite, designed by Mr. W. Fife, sen., for Mr. J. B. Macindoe, and Ulerin, designed by Mr. G. L. Watson for Mr. E. H. Hamilton. These, with Ulidia and Neptune, in the north gave very good sport, the racing between Ulerin and Marguerite being exceptionally good. Shona, 2-tonner. Designed by Mr. G. L. Watson in 1884 for Mr. G. Haig. Ulerin was by far the most successful boat. In the south she met and defeated Buttercup. She had no less than twenty-seven prize-flags at the close of the season, nearly all firsts, though she missed all the regattas before that of the Royal Mersey. There were also two new 5-tonners—Delvin, designed by Mr. W. Fife, sen., for Mr. R. Jameson, and Shona, designed by Mr. G. L. Watson for Mr. A. Haig. Delvin was the most successful of the class, but this might not have been the case had Olga not been run down by a ferry-boat on the Mersey, after beating both the new yachts. Nora was the next best boat of the season. Shona was rather oversparred – a not infrequent mistake about this date. Currytush, 3-tonner. Designed by Mr. W. E. Paton in 1884. A new 3-tonner, Currytush, was designed by Mr. W. E. Paton for Mr. J. J. McDaniel, which easily disposed of the other boats in her class. 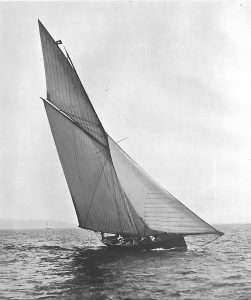 Of the Southampton length-class 30-footers, Eclipse, designed by Mr. C. P. Clayton for Mr. A. Manning, was the crack boat. She won twenty first prizes, and was remarkably fast and well handled. The 25-foot crack was Lil, by the same designer, and owned by Mr. F. Cox. 1885. Unfortunately there was a complete collapse of racing in the 40, 20, and 3 ton classes. Tara generally sailed with the first-class vessels, one of which, Galatea, was newly built for Lieutenant Henn from Mr. Beavor Webb’s design. Of the large class, Irex was the most successful, Marjorie being her most dangerous opponent. Marjorie was distinctly the more weatherly craft, but off the wind Irex was the faster. Marguerite was sailing in con­siderably improved form, particularly in light winds. Galatea proved distinctly disappointing, though she looked a very handsome and able vessel. Irex’s first prizes numbered nineteen, Marjorie won thirteen firsts, Marguerite won four firsts, and Galatea won only two second prizes. The racing between the 10-tonners Ulerin and Queen Mab was extremely interesting. The former had been bought by Sir Edgar Vincent, and the latter was a new boat designed by Mr. G. L. Watson for Mr. T. B. C. West. At first Ulerin seemed to be sailing in poor form, but a change of skippers worked an improve­ment, and she proved the superior of the new craft. 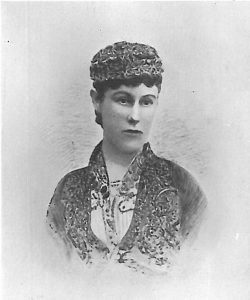 She had the distinction of winning the Queen’s Cup in the Nore to Dover match – a feat never achieved by so small a yacht. In the north, however, she found Marguerite a vastly improved boat, and of thirteen races between the two Marguerite won seven. Doris 5 tonner; designed by G L Watson in 1885 for Messrs R. and B. Allen. The 5-ton class was notable from the advent of Doris, designed by Mr. G. L. Watson for Mr. R. G. Allan. She proved by far the fastest of the class, Shona being her most dangerous antagonist. Delvin did not sail so well as Shona during this year. Luath, a new 5-tonner designed by Mr. W. E. Paton for Mr. G. B. Thomson, did not turn out a success. In the south two new fives’ were built – Jenny Wren, designed by Mr. R. E. Fronde, and Florence by Mr. W. S. Kelly, the former being the better of the two. 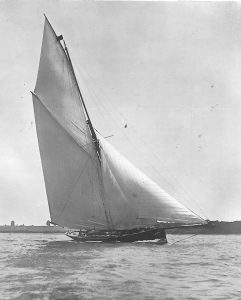 The Southampton 30-foot length class had a new boat, Curtsy, designed by Mr. C. P. Clayton for Mr. H. W. Forster, and she swept the board. Yum-Yum, by the same designer, and owned by Mr. A. O. Bayly, and Eclipse, had little or no chance with Curtsy. Frolic and Lil were the two best boats in the 25-foot class. Grayling, Yawl, 9 tons. Lieut. F. W. Chaine. shorter than Genesta, which was 81 feet on the load-line, with 15 feet beam. Puritan’s beam was 23 feet, and she had a centre-plate, with a standing draught of 8 feet. The result was a defeat for Genesta. In the first race she was beaten by 16 minutes in a very light wind. There was a good breeze in the second race, which Puritan won by 2 minutes 10 seconds. 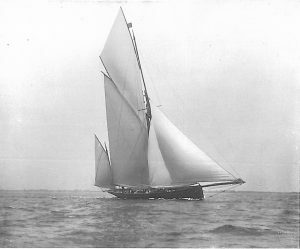 Genesta, however, raced against the Americanschooners Dauntless, Grayling, Fortuna, the sloop Gracie and the cutter Ileen, winning the Cape May Cup. 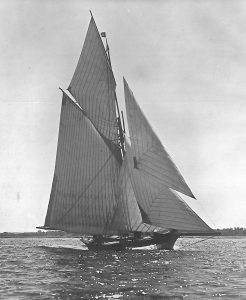 She also won the Brenton Reef Cup in a race of 36o miles, beating the schooner Dauntless by 6 hours. These victories went far to compensate the British for their disappointment. This year a new system of classifying yachts came into force. The Yacht Racing Association, with a view to encouraging out­classed racers to enter sailing matches, suggested the division of the classes into A, B, and C, the last two having specified spar measurements according to tonnage. The B classes were not numerous, as it was found advisable to cut spars down to fit the C class, for the sake of extra time. Irex. Owned by Mr. John Jamieson. Coila, Cutter, 3 tons. 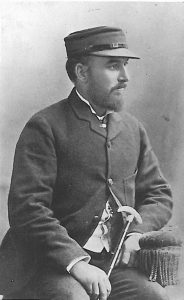 Mr. F. J. Stephen. weather craft, and could beat Lenore in a strong breeze. Queen Mab was the best of the 10-tonners, though Marguerite ran her very close, and Doris was crack of the 5-ton class. 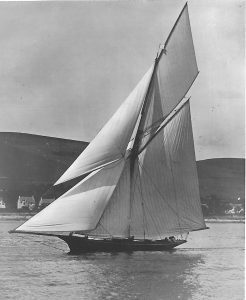 Five new 3-tonners were built for the 3-ton class on the Clyde: Ariel, Mr. P. Donaldson, designed by Mr. W. Fife, jun. ; Coila, Mr. A. E. Stephen, from his own design; Cora, Mr. M. H. Kennedy, designed by Mr. W. E. Paton; Daisie(Mr. J. W. Clark) and Rona (Mr. J. S. Clark), both designed by Mr. G. L. Watson. Of these Ariel was the most successful. All the boats were of very extreme dimensions – about 29 feet l.w.l., with 4 feet 6 inches beam. A sad fatality occurred in the spring of the year by which Mr. W. E. Paton lost his life. He had designed a 5-tonner for Mr. Heyn and Mr. J. Plunkett, and made the voyage with Mr. Plunkett and three hands from Southampton to Ireland in the spring. During a very heavy gale the yacht was driven ashore at Malahide, probably through mistaking Lambay Island for Howth Head, and all on board were drowned. The yacht was washed up practically unharmed, with the exception that her keel was torn out, on the sands at Malahide. Mr. Paton was a most promising young designer and his death was much deplored. The C class restrictions suited some of the older vessels well. Neptune and Arethusa sailed remarkably well, and Silver Star seemed to like her smaller spars. 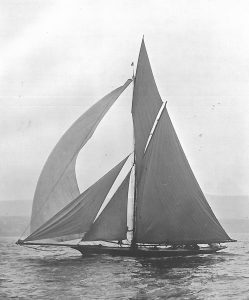 Of the older ‘twenties,’ Moira (Mr. E. H. Hamilton) showed remarkable speed on the Clyde. The Late Lieut. Wm. Henn (Galatea). Lieutenant Henn raced Galatea for the America Cup this year. The yacht had proved a failure in England, and therefore her defeat was not unexpected. A new defender, Mayflower, was built, and proved a faster vessel than Puritan. She was designed by Mr. Burgess, and had ample beam. Mayflower won the first match by 12 minutes 1 second (corrected time), and the second and final match by 29 minutes 9 seconds (corrected time). Galatea would probably never have proved the equal of either Genesta or Irex, but it should be said that at the time she sailed these races her lead was very far from being solid. Had it been properly run into the vessel, there is no doubt she would have exhibited greater speed than she showed in these matches. Her owner, Lieutenant Henn, was exceedingly popular on both sides of the Atlantic.